Seagulls resting on an iceberg in Disko Bay near the town of Ilulissat, Greenland. Rating your photos in Adobe Lightroom is a great way for you to quickly organise and later recall your very best photos. It's a very simple process and is one of the reasons why I recommend Lightroom as the ideal, one stop shop, for the needs of most amateur and enthusiast photographers. Let me show you how. When my workflow was entirely based in Lightroom I'd process all my photos, except for those that were immediately deleted. These days, due to HDR and my image processing very much revolving around Photoshop, it takes longer to process photos. As a consequence I don't process as many images as I used to. However, the final results from those images are better and, for me, that's what matters most. While Photoshop is central to my own post processing workflow, the process begins and ends with Lightroom. The grid interface within the Library module inside Lightroom. Notice the star ratings below each of the thumbnails. If you look extra hard you may also see that the image of the seagull in flight has been flagged with a tiny white flag in the top left corner of the thumbnail. You might also notice that the photo of the sheep grazing has a tiny purple colored square to the right of the stars along the bottom edge of that thumbnail. There are several ways to rate your images in Lightroom, all via use of the Toolbar which you can make visible in the Library module by hitting the T key on your keyboard. Otherwise simply head up to the main navigation in the Library module and click View. The very first option you'll see will be Show Toolbar or Hide Toolbar, depending upon whether it's turned on or off. Once the Toolbar has been switched on you should notice it down at the bottom of the Library module. If you have a row of thumbnails displayed along the very bottom of the Library module then the Toolbar will be just above those thumbnails. Go to the far right of the Toolbar and look for a white downward facing arrow. Click on that arrow and select what you'd like displayed (e.g., Flagging, Rating, Color Label) within the toolbar. It's best to think of the word Rating as Star Rating, given you'll use that feature to rate images from 0 to 5 stars. The amount of options you're able to display along the Toolbar can be dependent upon the size of the screen on which you're working. Now let's look at the three methods by which you can rate your photos in Lightroom. Here's a close-up view of the above screen grab showing the various rating systems in the Library module of Adobe Lightroom. Hopefully you'll now be able to make out the stars, flag and purple colored rating. If not simply click on the image to see it enlarged. It's easy to Flag your images with either a pick or rejected flag. If you're into keyboard shortcuts you can use the p key to pick an image or the x key to mark an image as rejected. While simple to implement I find this method restrictive. I want the ability to categorize my images by more than simple good/bad, yes/no tags. 0 stars = unrated photos with no decision made. I would not delete any of these images. 1 stars = photos marked for deletion. At a later stage I come back and filter (i.e., sort) the photos in a particular folder to equal 1 star. Once those images are displayed I take another quick look at them prior to deleting them all in one simple move. 2 stars = spares that are not particularly strong images, but are kept if needed (e.g., the only photo of granny made at an important family celebration). Usually these images remain unprocessed and are not shared. Eventually some or all of them may be re-assigned with a 1 star rating marking them ready for deletion. 3 stars = photos that I'm happy with that are marked for processing. 4 stars = processed photos that are marked for publication/sharing (i.e., social media, blog, galleries, exhibition prints). 5 stars = what I consider to be my very best 4 star images that I've processed and shared and have decided to elevate to a 5 star rating. As this represents the best of the best I apply this rating very sparingly. A task for later this year will be to review all my current 4 star images and see which of them I feel should be elevated to 5 star ranking. I'II feel good when I get that job done and will ensure all my 4 and 5 star images are backed up onto several external hard drives, one of which is stored offsite, and also onto the cloud on a variety of online services. A graveyard in lush fields behind a church in rural Iceland. I know that a lot of folks apply the 5 star rating to their favorite images from a particular photography session or outing. I don't see the sense in that because, after a few years, you're going to have a significant amount of 5 star images within your Lightroom catalog. If, like me, you decide to only rate your very best photos with a 5 star rating then you shouldn't expect that you'll be able to do so following each and every photo session. Each to their own and, while I'm very happy with a lot of the images I create, I'm not sure I've ever used the word awesome to describe one of my own photos. On a related matter the above photo features a graveyard in lush fields behind a church in rural Iceland. I don't consider it to be a great photo but as it allowed me to explore the use of a wide-angle lens, for teaching purposes, I decided to process it. Now that it's been published it's become a 4-star image. But that doesn't mean I consider it to be just below my very best images in quality. Far from it. 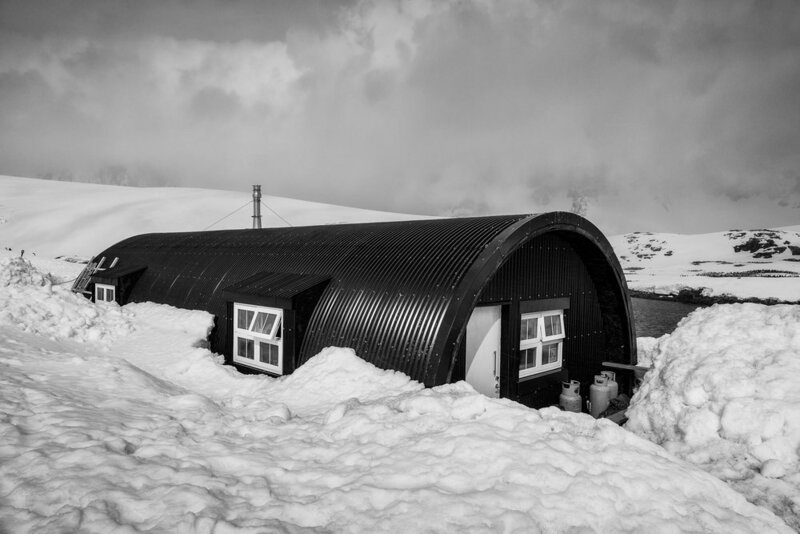 A shelter for the research scientists who live on site at Port Lockroy on Wiencke Island in Antarctica. An alternative to the star rating system is to use a color rating system in Lightroom. You can rate your photos by color using the colors red, yellow, green, blue and purple to separate one kind (e.g., genre) of photo or result (e.g., poor, good, great) from another. I'd find that system harder to work with and I'm sure I'd have trouble remembering which color was equivalent to a particular star rating. I suppose you could simply work left to right with the colors, but I like to keep my desktop and associated application interfaces as clean as possible. I don't use colors or flags all that much. However I do use the color purple to identify a sequence of images that belong to a particular HDR (i.e., High Dynamic Range) series. After selecting the images in question I then group them into a stack and move the final image composite from that series to the top of the stack. You'll find that option, from the drop down menu in the grid view of the Library module in Lightroom under Photo>Stacking>Group Into Stack. The star ratings, while really easy to apply and to identify, are still quite unobtrusive, which is another reason why I prefer them. I use the star rating system in Lightroom quite extensively. It's the basis upon which I go about sorting and deleting photos as well as retrieving them for post processing and publication. There are opportunities to combine the color and star rating systems together. This could be useful if you want to separate particular groups or genres of images within a particular star rating. If you wanted to add sub-ratings to your 4 star published images you could add color ratings to separate them into, for example, 4 star good, 4 star better and 4 start best. I don't currently do that. You could also separate 4 and 5 star images into genres by adding a green color rating to your 4 and 5 star landscapes, red for portraits, etc. If you have lots of 4 and 5 star images that might be worth thinking about. However, I prefer to keep things simple and, for the most part, to stick with the star rating system. The Collections panel in Lightroom, a major component in my Lightroom workflow. Once processed I'm able to separate portfolio and blog images from those that will only exist on social media and those that will remain on my external hard drive as spares, shared only if needed or requested. I find Collections in Lightroom to be a fantastic way to organise my images. Basically I open up a particular folder of imported and processed images, in the grid display (keyboard shortcut g) within the Library module of Lightroom. Once I've rated those images, following my star rating workflow previously outlined, I simply click and drag the 4 and, where applicable, 5 star images into a Collection (e.g., Iceland) I'd previously created. To ensure a neat and tidy interface I nest, a little like subfolders, various collections (e.g., Iceland, Belgium, Germany) inside a higher level Collection Set (e.g., Europe) which can be collapsed and expanded as required. I also apply Keyword phrases to images to further categorize my photos. Keywords are a great way to find one or more images, in a matter of a few seconds, from a potentially gigantic catalog of images. You just have to add the appropriate keyword phrase/phrases to your photos as part of your normal workflow, either during import or at a later stage. It takes time and isn't for everyone, but I find it a great help and it's usually a far better alternative to scrolling through a whole bunch of folders looking for a single photo. This is a quite a far reaching post. Managing your precious photos through image Rating, Collections and Keywords are all significant topics which I've really only been able to introduce you to this time around. In the future there'll be other ways in which we'll be able to dig deeper into each of these topics that are essential in helping you create an efficient and organized workflow for your photos. If you live in or nearby Melbourne, Australia you may wish to contact me regarding a private one-to-one photography class which, if you like, could include Lightroom workflow.